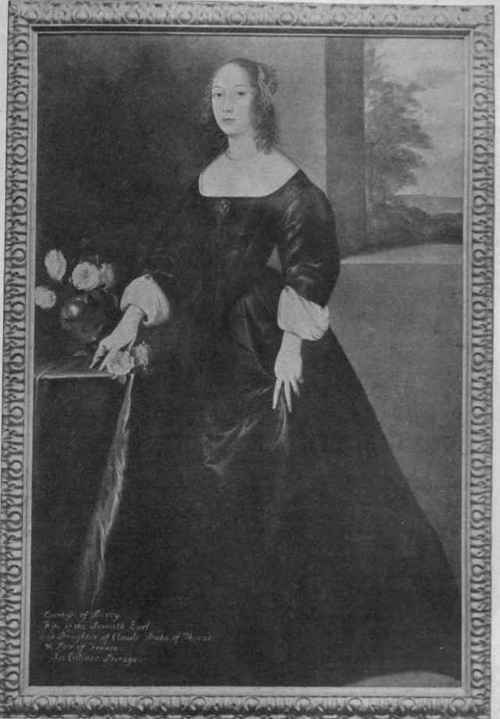 Charlotte de la Tremouille was a daughter of Claude de la Tremouille, Duke of Thouars and Prince of Palmont. She married when very young, and her husband, James seventh Earl of Derby, had himself not yet completed his twentieth year. He is described as a man possessed of many accomplishments and many virtues. Certainly he was an admirable husband - indeed, a more loving and devoted couple than him and his wife it would be impossible to find in seventeenth century England - and he lived with her in splendid, sacred privacy, superintending his immense estates in Lancashire and in the Isle of Man, where the Earls of Derby then exercised an almost royal sway. The lamentable crisis of the great rebellion, however, drew him immediately from the even tenor of his way. Indeed, he was amongst the first of the loyal nobility who hastened to join King Charles I. after the declaration of war in 1642. Unfortunately, a change of tactics by Charles's Council rendered his early endeavours in a great measure abortive. It had been first determined to raise the Royal Standard at Warrington; and Lord Derby, whose influence in that part of the country was unbounded, had been sent back into Lancashire to collect the military forces of the county. In a surprisingly short time he had mustered 60,000 men, and was about to take the same steps in Cheshire and North Wales, when suddenly he received notice that the King had resolved to set up his standard at Nottingham, and that he himself must return to headquarters with such troops as he might be able to equip. In the meanwhile, however, many of the Lancashire men had returned to their homes, and many others had joined the rebels. Lord Derby was greatly mortified, but, none the less, succeeded in raising amongst his friends and tenants three regiments of infantry and as many cavalry. He then joined his Sovereign at Shrewsbury, and was ordered to proceed from there to take Manchester by storm. At the last moment, however, his men were retained with the main army, and he was sent again to Lancashire to collect further levies. But by this time Lancashire had been nearly lost to the Crown, and the rebels were even designing to seize the Isle of Man. Lord Derby, therefore, proceeded thither immediately. His wife and children remained at his mansion of Lathom in Lancashire. The building required but little to render it in a measure defensible, and so, placing at her disposal such soldiers, arms, ammunition, and provisions as he could hastily collect, the earl left the completion of the works and the defence of the place to his wife. Scarcely had he gone, however, before the countess received intelligence that an attack was imminent. She lost no time, therefore, in increasing her provisions and military stores, and admitting such neighbours as might be depended upon in order to strengthen her small garrison. These, with her servants and retainers, she formed into six regiments, at the head of which she placed some gentlemen of the county, giving the chief command to a Captain Farmer, who subsequently was killed at Marston Moor. These arrangements she carried out with the utmost caution and secrecy, and the rebels had no expectation of any resistance until'they arrived on February 28th, 1644, within a few miles of the house. Fairfax, who was in command, sent a trumpeter to request a conference with the Countess of Derby. To this she agreed. Fairfax offered her an honourable and safe removal with her children, retinue, and property (arms and ammunition excepted) to Knowsley Hall - another mansion belonging to the Earl of Derby - and promised that she should remain there unmolested. The countess replied that she held a double trust " of faith to her husband, and of allegiance to her Sovereign, and she desired to be given a month to consider her answer." This request was denied. Accordingly, "she hoped he would excuse her if she preserved her honour and obedience, though, perhaps, to her own ruin." Fairfax departed, and for some days was in doubt whether to attack Lathom or lay siege to it. Eventually he adopted the latter course, owing to false intelligence being purposely conveyed to the rebels by one of Lord Derby's chaplains, who stated that the military force of the garrison was strong, but that they were short of provisions. After waiting a fortnight, therefore, Fairfax sent to demand an immediate surrender. Lady Derby replied that " she had not yet forgotten what she owed to the Church of England, to her sovereign, and to her lord, and that till she had lost her honour or her life she would defend that place." The rebels then began to make trenches, and on March 24th she ordered a sally of 200 men, who attacked the besiegers, killed sixty, and took some prisoners, with the loss on her side of only two men. The enemy now doubled their guard, and began to draw their lines at a greater distance, but were so harassed by sallies that fourteen weeks elapsed before they could complete their works. But at length they achieved their purpose, and were able to mount a strong battery, with a mortar of large calibre, so near the house that a shell could be thrown into the apartment where the countess and her children were at dinner. Fortunately, they escaped unhurt, and immediately another sally was made. The rebels were again defeated, their guns spiked or thrown into the moat, with the exception of the large mortar which was dragged within the defences. And a few days later the garrison made another successful sortie. I will have the messenger hanged at the gates." But now the garrison were reduced to the greatest distress ; their ammunition and corn were exhausted, and they had been obliged to kill most of their horses for food. Lord Derby, therefore, hastened from the Isle of Man, and, with Prince Rupert, set out to effect a relief. Rigby then forthwith raised the siege; and the countess was able to escape with the earl to the Isle of Man. But the rebel Parliament confiscated the great estates, and detained his children in cruel captivity for eighteen months. Husband and wife remained on the Isle of Man for a time. Then Lord Derby joined the forces of King Charles II., but fell into the hands of the enemy after the battle of Worcester, and was beheaded at Bolton on October 15th, 1651.
" My dear Heart, - I have heretofore sent you comfortable lines, but, alas ! I have now no word of comfort, saving to our last and best refuge, which is Almighty God, to whose will we must submit. . . . The governor of this place, Colonel Duckenfield, is general of the forces which are now going against the Isle of Man ; and, however you might do for the present, in time it would be a grievous and troublesome thing to resist, especially those that at this hour command the three nations : wherefore my advice, notwithstanding my great affection to that place, is, that you would make conditions for yourself and children and servants and people there, and such as came over with me, to the end you may get some place of rest where you may not be concerned in War.
" I conjure you, my dearest Heart, by all those Graces that God hath given you, that you exercise your patience in this great and strange trial. If harm come to you, then I am dead indeed ; and until then, I shall live in you, who are truly the best part of myself.
" When there is no such as I in being, then look upon yourself and my poor children ; then take comfort, and God will bless you. I acknowledge the great goodness of God to have given me such a wife as you, so great an honour to my family, so excellent a companion to me, so pious, so much of all that can be said of good, I must confess it impossible to say enough thereof. I ask God pardon, with all my soul, that I have not been enough thankful for so great a benefit ; and where I have done anything at any time that might justly offend you, with joined hands I also ask your pardon. I have no more to say to you at this time than my prayers for the Almighty's blessing to you, my dear Mall, and Ned and Billy.-^-amen, sweet Jesus." Lady Derby remained in Man, in a condition of great poverty, her health broken with grief, but her spirit still unsubdued. But, finally, a despicable creature named Christian, whom Lord Derby had treated with the utmost kindness from childhood, and to whom he had committed the care of his wife and children, as well as the command of the military forces of the island, betrayed the island to the enemy. Lady Derby and her children were, for a time, imprisoned, and on their release actually subsisted on the charity of their impoverished friends until the Restoration.